Tom Seguin is an independent appraiser of fine jewelry serving the Tampa Bay area from his office in Bradenton, Florida. Mr. Seguin began his career in the jewelry industry as co-owner of Pure Excellence Fine Jewelry, a custom jewelry design jewelry studio in Sarasota, Florida in 1984. He earned his Graduate Gemologist (G.G.) diploma from the Gemological Institute of America in 1986 and earned his Master Gemologist Appraiser designation from the American Society of Appraisers in 1987. Mr. Seguin owns and operates Suncoast Gem Laboratories, which is the only state-of-the art Certified Gemological Laboratory of the Accredited Gemologists Association on the Gulf Coast of Florida. He is a member of the Accredited Gemologists Association and adheres to the Uniform Standards of Professional Appraisal Practices (USPAP). Fewer than 50 people in the United States have attained that level of certification. 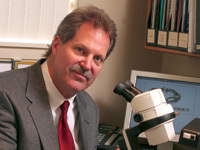 His wife Donna Seguin earned her Graduate Gemologists diploma in residence in 1989 and is on staff as an appraiser also. 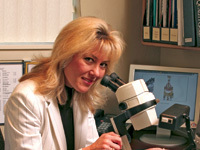 She is a member of the National Association of Jewelry Appraisers and has been active in the Women’s Gemologists Association and the GIA Alumni Association. At Suncoast Gem Lab, your appraisal will be performed according to the Uniform Standards of Professional Appraisal Practice (USPAP) and those of the American Society of Appraisers and the National Association of Jewelry Appraisers. We work by appointment and in most cases the appraisal is completed and emailed to you at the end of your appointment. If needed, we will email a copy of the completed report to your Insurance Agent or Attorney. Each piece will be weighed, measured, and described in detail. Gemstones will be identified, graded, measured and their weights calculated. Metal content will be determined and noted. All diamonds over ½ carat will be issued a stone certificate, with color, clarity and proportions listed. The internal characteristics of the stone will be diagramed (plotted) on diamonds over 1.00 carat. Colored gemstone certificates will be done when appropriate. Your appraisal will have enlarged digital color photos of the items printed right in the report. Photomicrographs (color photos through the microscope) are available if needed for insurance claims, etc. Your appraisal will explain the grading system used. An appointment for one of two items usually lasts about an hour barring anything extraordinary. You will be emailed a digital copy of the report as a pdf. document at the end of the appointment which you can print if necessary or email to your insurance agent and then store on your computer for future reference. You will need an appraisal if you want to obtain insurance coverage on jewelry items, if you plan to sell your jewelry or use it as collateral, to settle an estate or for fair and equitable distribution of gifts, to claim a casualty loss for your insurance company or the IRS, to divide property in a divorce, or for a tax deduction of charitable contributions of gems or jewelry. It is unethical for an appraiser to base his fee on the outcome of the appraisal. If, for example, the fee were a percentage of the value it would logically make the appraiser lean toward a higher value. At Suncoast Gem Lab, our fees are charged per item or per hour. How often should I have an appraisal? The Insurance Institute if America recommends that jewelry is re-appraised every two years. Each insurance company has their own rules and guidelines. You should consult your Insurance Agent and find out what your insurance company requires. At Suncoast Gem Lab, your appraisal will remain active in our database for a minimum of seven years. If you update your appraisal before that time it can be done relatively quickly and thus at a savings to you. You may leave your jewelry for appraisal, or arrange to wait while the laboratory work is carried out. Many prefer to leave the items for appraisal, spend a few hours shopping or doing errands, and return to pick it up later in the day. Are there different types of appraisals? Which kind do I need? Insurance – Insurance appraisals are used for insurance purposes, usually to determine the coverage amount on your jewelry. This purpose of this appraisal is generally twofold: the value that is given to your pieces is used to set your premiums, and the description is used in order to replace the piece if necessary. Because of this, it is very important that the descriptions be extremely detailed and specific as far as quality of manufacturing and gemstones. Fair Market Value (FMV) – Fair Market Value appraisals can be used for a variety of purposes, including liquidation, collateral, divorce settlement, investment, estate/probate, and charitable contributions. The purpose of the appraisal determines the market that is used to calculate the value of your jewelry. The best way to determine which of these fair market value appraisals is right for you, is to tell your appraiser what you intend to do with the piece, or the reason why you want to have it appraised. So what do all of your qualifications mean to me? There are a lot of appraisers out there, and they aren’t all equal. Some appraisal designations require a lot more time and knowledge to earn than others. One of the most respected accreditations that a gems and jewelry appraiser can earn is the American Society of Appraisers Master Gemologist Appraiser designation. ASA requires that Master Gemologist Appraisers re-certify every 5 years to make sure that they stay current with new technologies and information. To stay current all Master gemologist Appraiser’s must complete 100 hours of continuing education between re-certification. Re-certification also makes sure that the appraisers are still able to perform all of the functions involved in appraisal process at the high standards of the ASA. To become an MGA, they must be a Graduate Gemologist (GG) of the Gemological Institute of America, have five years of full-time appraisal experience, and complete extensive course study and exams that cover the full range of duties that appraisers are expected to perform. Consumers often ask us what they should consider when selecting a personal property appraiser. This is not an easy question to answer as the appropriate use (reason for needing an appraisal) as well as the items involved influence our answer. Also, keep in mind that presently anyone who wishes to hold themselves out to the public as an appraiser can do so. No certification, educational requirements, memberships or licensing are required in any state. In other words, qualified or not, appraisers are out there appraising everything from furniture, fine art and gemstones to rare carpets. Regardless of the assigned use or item, seek an appraiser with credentials. Ask them to provide their professional designations. Ask them what their specialty education is. First of all, they should have credentials that are related to the item they are appraising. For example, if the item is a piece of jewelry, then they should have related training. In the case of jewelry, at the very least he or she should be a gemologist. Ask them what, if any, appraisal education they have. Secondly, they should have credentials in appraising. This is separate from specialty training. For example, gemologists are taught how to grade and identify gemstones. They are not taught appraising. That has to be obtained outside of the specialty of gemology. Verify all major professional designations. Credentials are often embellished. Let me repeat that – credentials are often embellished! Do not assume the person to actually have the title or professional designation. It has been my experience that among appraisers, two out of five lie about their professional profile. You will encounter outright lies. Ask them to produce the credential or to provide a telephone number with which the credential can be verified. You will encounter out-of-date credentials. If the appraiser claims to be a member of a society, check on it. Often they were a member years ago but are not now. Often this is due to the society requiring continuing education and testing to continue membership. You will encounter credentials that are non-existent. Yes, appraisers will simply create a title or credential and then add it to their name. When asked, they will not be able to back-it- up. Finally, there are titles that are provided by societies that are not based upon education, testing and re-certification. This is not unlike the diploma mills we have all heard about. In the same category are grand fathered professional designations (someone who has been a long-time member can have a title that new members are required to train, test and be certified in order to attain). As you can see, credentials are the biggest key to avoiding getting stuck with an unqualified appraiser. Of course, if you are in the Tampa Bay area of Florida, then I am available to appraise your gemstones and jewelry by appointment so you do not have to leave your items.